This article will walk you through creating Microsoft synced resources. Its a good idea to have familiarised yourself with Timekits definition of a bookable resource before reading this article. Timekit can be used without your users even knowing, as resource creation and synchronization can be done 100% through the API. In case you need your resources to be synced with Microsoft this tutorial should help. This sign-up URL is specific to your Timekit app and should be used for all your resources. The resources must navigate to the URL and grant Timekit access to their Microsoft calendars, in order for Timekit to be able to sync their availability. Nifty eh? Now you have a Microsoft synced resource. 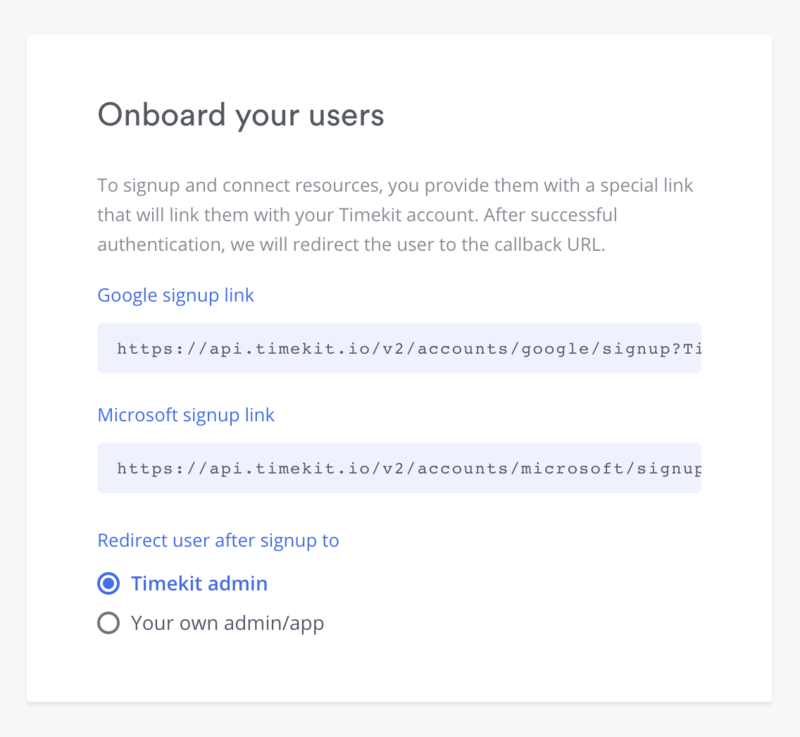 Note: Remember that you can change the callback URL if you'd like the resource to end somewhere else than the Timekit Admin dashboard after the sign-up process. This is useful for redirecting your user to your own server (to save resource info) or a custom admin panel. You you're ready to really start using Timekit, by means of our FindTime engine that you query for availability, please read this introduction to availability or just jump right to the tutorial on how you find availability.